The route and Shenandoah National Park. Our 2014 travel schedule is taking shape. We’ve already completed most of the planning for our three week trip to Alaska in July/August (details to come) so it was time to turn our attention to spring break in April. It’s been a long time since we headed East, our summer 2010 Canadian/U.S. loop was the last time we went that direction. 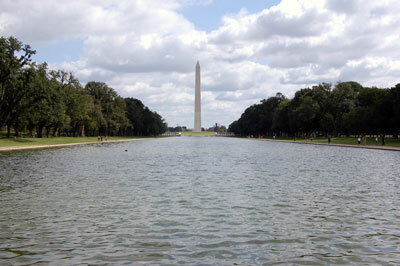 To fill in some new territory on the map, an obvious choice for major destination became Washington, DC. Of course because of the way we travel, we won’t be going just to DC, we’ve selected a route that takes us to a national park, several historic battlefields, 7 states (plus the District), a president’s mansion and a small town where Meriwether Lewis spent time preparing for the Corps of Discovery expedition. The first night’s stop will be Columbus, Ohio. An easy 5.5 hour drive will get us there in time to see a few sights, grab some dinner and a drink or two and rest for the night. The Short North neighborhood seems like where we’ll head for some local flavor. We found a steal on a four star hotel on Hotwire and ended up at the Sheraton Capitol Square, in the very center of the city. Tip: Hotwire currently has a coupon for $25 off a purchase of $100 or more when booking through their mobile app. The following day will take us southeast from Columbus into West Virginia. From The state capital of Charleston, we’ll jump off the intestate and drive the Midland Trail scenic byway toward Fayetteville and the famous New River Gorge Bridge. You may know it from the West Virginia state quarter. 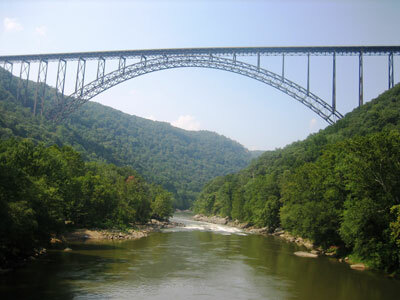 It is currently the fourth longest steel single-span arch bridge in the world and it soars 876 feet above the New River below. We just discovered that on the underside of the bridge structure, there is a 2 foot wide open-air catwalk called the Bridge Walk that you can take a tour of, so we’re hoping to make reservations. After that we will continue to our second night stop in Charlottesville, Virginia. As there aren’t a ton of hotel options in smallish cities, we chose the bed and breakfast route and will be staying just blocks from Main Street at 200 South Street Inn. Monday will begin with a visit to Monticello, the home of our fourth president, Thomas Jefferson and end at the Skyland Lodge in nearby Shenandoah National Park. Skyland is the only lodge open that early in the season, so hopefully we’ll have a nice uncrowded park to explore. Shenandoah is a long, narrow park straddling a ridge in the Blue Ridge Mountains. The 105-mile Skyline Drive runs the entire length and has many hiking trails, viewpoints and historic sites along its length. 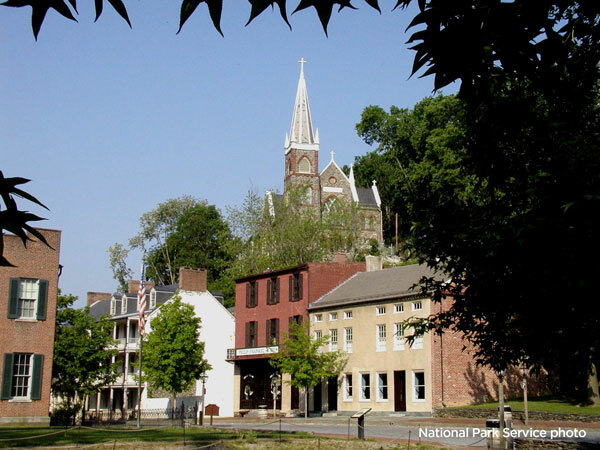 The next overnight town of Harpers Ferry, WV is a bit more obscure, but it has popped up in several books I’ve read recently and most of it is a National Historical Park. Back in the early years of the United States, its remote location up the Potomac River from the District of Columbia made it an ideal location for an armory, hidden away from foreign attacks from the ocean. Meriwether Lewis even spent time there preparing to cross the continent. It later was a crossroads during the civil war, changing hands between North and South at least eight times (estimates vary). Additionally, the Appalachian trail passes through Harpers Ferry and it is the headquarters of the Appalachian Trail Conservancy. It looks like it will be a great place for a little hiking and history. While in town our accommodations will be the Laurel Lodge bed and breakfast overlooking the Potomac River gorge. From Wednesday through Saturday we’ll take in D.C. and all it has to offer. Basically the city has a museum on every block and we’re currently perusing our options to see where we want to spend our time. We have contacted our U.S. congresswoman’s office to check the possibility of touring the White House (because you have to) so we’ll find out if we’ve been approved at a later date. Unfortunately, the capitol’s rotunda will be off-limits the week of April 14th while they install a “protective donut” (seriously) as part of the two-year dome restoration that is just getting underway. Conveniently, we have friends who live just a 15 minute walk from the capitol and offered us a place to stay. The new road trip machine. Wrapping things up, the route back to Chicago will include a quick stop in Gettysburg, PA for some more civil war history and an overnight in Cleveland because we hear there’s good food there and also Drew Carey says it rocks. Overall it should be about a 1,900 mile trip, which is short compared to our last trip from Seattle to Chicago. 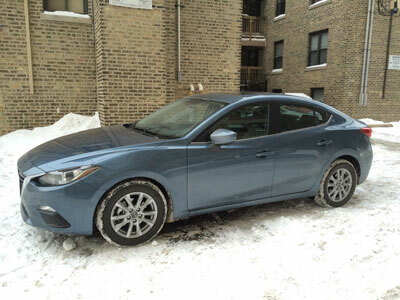 It will be nice to not need to pay for a rental car this time as we will be traveling in style in Nick’s brand new Mazda 3. Stay tuned for more updates as the departure date approaches. This entry was posted in News, Upcoming Travel and tagged Charlottesville, Chicago to Washington Road Trip, Harpers Ferry, Monticello, New River Gorge Bridge, Shenandoah National Park, Washington DC Road Trip. Bookmark the permalink.